Unlike the 2016 release, SharePoint Server 2019 is bringing a wide variety of new features to the on-premise platform. Many of these features have been rolled out to SharePoint Online customers over the last two years, so they are well tested and mature. One disappointment is support for on-premise forms and workflows. 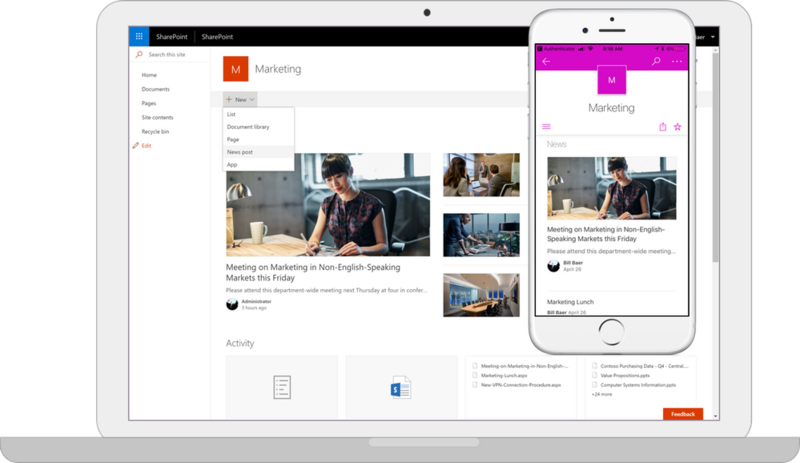 While SharePoint Server 2019 will support the use of PowerApps and Microsoft Flow, it will require an Office 365 subscription and installation of the data gateway to create a complete solution. This is only viable for customers who are planning a hybrid Office 365/SharePoint on-premises deployment. Customers wishing to stay 100% on-premises can continue to use the deprecated InfoPath 2013 and SharePoint 2010 and 2013 workflow platforms, or they should look to a 3rd party product such as Nintex to meet their forms and workflow needs. Will your organization adapt to modern sites immediately or over time? What complexities and changes to user experience should you expect? How to address existing workflows and forms? What migration approach is best for your organizational needs? Will you have a hybrid Office 365 and SharePoint 2019 environment? Native database attach method: quick and clean, existing sites maintain classic experience, full fidelity of content, configuration and history. Start building new modern sites when your users are ready. This is the fastest way to retire your SharePoint 2016 infrastructure. Migrate to modern sites: create new sites using the SharePoint 2019 templates and use a tool such as ShareGate to migrate content into the new sites. This is a more intensive process, but it allows you to adopt the modern experience as you adopt SharePoint 2019 and retire outdated sites and content. Native database attach method: quick and clean, existing sites maintain classic experience. You’ll need a temporary SharePoint 2016 farm to upgrade the content database schema before you can attach to the SharePoint 2019 farm. We call this a “double hop” upgrade. If migrating from 2010 we recommend a migration tool. Migrate sites straight to 2019 with a tool. Some caveats apply since this method “recreates” the site configuration and migrates the content (historical users, linked list integrity, inflight workflows) but the outcome is like a database attach upgrade. The migrated sites will remain in “classic” mode. Interested in upgrading to SharePoint 2019 but need some help with the planning? General Networks is a Microsoft Gold Partner and authorized SharePoint planning and deployment provider. Our team of Senior Consultants is well-prepared to help you outline the best path forward for your organization, while eliminating surprises and minimizing the pain of the upgrade process. Since 2007, we’ve delivered 100s of SharePoint and Office 365 projects including migrations that range from a few site collections to large enterprise deployments. Contact us to schedule a complimentary upgrade assessment!